This Green Curry Chicken tastes like a green curry should - very aromatic and bursting with flavor. It's a creamy green curry that isn't as high in calories as some others I've tried due to the use of half coconut milk and half evaporated (a trick I learned in Thailand). Includes lots of healthy vegetables for an excellent chicken curry you'll want to serve both family and friends. ENJOY! For my step-by-step Thai Green Curry Chicken recipe, see: How to Make Thai Green Curry Chicken. 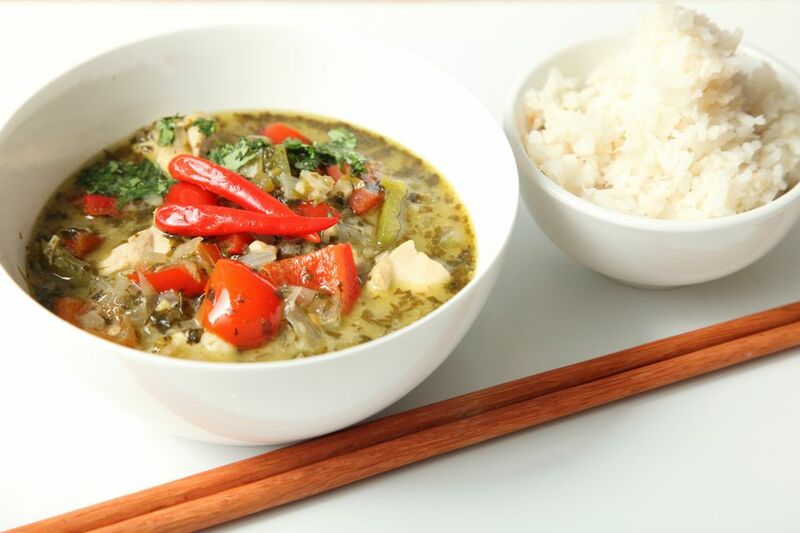 For a Vegetarian/Vegan recipe, see Vegetarian Thai Green Curry. Place green curry paste ingredients in a food processor or blender and blitz to create a fragrant green curry paste/sauce (add more coconut milk if needed to help blend ingredients). To make the sauce by hand: Mince and stir all sauce ingredients together in a bowl, OR use a pestle & mortar to mash dry ingredients followed by liquid ingredients. Set aside. Place a wok or large frying pan over medium-high heat. Add a little oil and swirl around, then add your green curry paste. Stir-fry 1 minute to release the fragrance. Add the chicken. Stir-fry until well saturated with sauce. Add 1/2 can evaporate milk, plus the lime leaves (if using). Stir and reduce heat to medium-low. Simmer chicken 5-6 minutes. Add 1/3 to 1/2 can coconut milk, plus the green vegetables (except basil) and continue simmering another 3-4 minute. Add the cherry tomatoes and simmer 2-3 more minutes. Avoid over-cooking - you want the tomatoes to keep their shape and the green vegetables to retain some of their crispness. Remove curry from heat and taste-test it for salt and spice. If not salty or flavorful enough, add 1 more Tbsp. fish sauce. If too salty for your taste, add another squeeze of lime juice. If too spicy, OR if you'd like more sauce, add what is remaining of your can of coconut milk. If you'd like it sweeter, add a little more sugar. Serve directly out of the wok, or transfer to a serving bowl. Sprinkle with the fresh basil (slice larger leaves into shreds). Sliced red chili can also be used as a topping, or to add more spice (as shown). Serve with plenty of Thai jasmine rice, and ENJOY! For a lighter green curry: Simply substitute chicken stock for the evaporated milk. Add a little more lime juice when taste-testing (to balance out the saltiness), as needed.